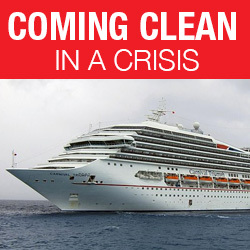 The recent crisis aboard the Carnival Cruise ship that lost its engine and became stranded in the Gulf of Mexico offers many lessons, besides thinking twice about booking a cruise. As law firm media relations professionals know, especially in the era of brand journalism, Carnival should be taking a stronger, more proactive stance on this crisis. The key to brand journalism is to tell your own story. This applies, sometimes more importantly, during a crisis as well. The cruise line has remained fairly silent on the conditions aboard, except to report the plan for getting the passengers to safety—a “mere” three days after a fire rendered the ship useless—and to assure the public that there is hot coffee. In the meantime, passengers are reporting horrific conditions onboard. Which story is true? Equally important, which story will the public believe? When faced with a crisis, managing your public reputation is important, and sharing as much information as possible goes a long way to assuring consumers of your brand that you are making every effort to do the right thing. Staying silent invites others to tell your story for you. To help you prepare for the unknown, take a look at our crisis communications template.